The Third Gyalwa Karmapa, Rangjung Dorje, was born in 1284 in Tingri Lankhor, in the Central Tibetan region of Tsang. His parents were tantric practitioners of the Nyingma lineage. At the age of three, Rangjung Dorje announced that he was the Karmapa, and went on to impress upon his friends his vision of a society, in which wisdom and compassion had precedence over worldly matters. At the age of five he met Orgyenpa, who, because of the precise instructions of the previous Karmapa and his own dream signs, was expecting him. 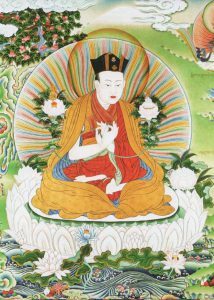 Recognising his former root Lama, Orgyenpa gave Rangjung Dorje the personal belongings of Karma Pakshi, bestowed the full Kagyu empowerments and instructions, and enthroned him as the Third Gyalwa Karmapa. Rangjung Dorje had visions of protectors such as Mahakala, who told him to go to Tsurphu, the seat of his predecessors. Accordingly, Rangjung Dorje grew up in Tsurphu Monastery where he received many teachings and transmissions, including those of both the Kagyu and Nyingma traditions, Kalachakra and Chöd. At the age of eighteen he received novice ordination and, after a retreat on the slopes of Mt. Everest, he went on to take full ordination. Rangjung Dorje had an insatiable thirst for knowledge that embraced all traditions, leading him to study with the greatest scholars and masters of his day, including those at one of the famous Kadampa colleges of learning. After some travelling, during which he visited Karma Gön in Kham, established the hermitage of Lhateng, and visited Tsawa Gang, he returned to Central Tibet and donated a parasol to the Jowo in Lhasa. Back at Tsurphu, he established the Dechen Teng hermitage at Druzhi and constructed a temple with a gilded roof. He then continued his education and practice, receiving teachings on Kalachakra, Guhyasamaya and numerous other Vajrayana transmissions. He also received teachings and instructions in the Dzogchen Nyingthig tradition from Rigdzin Kumaraja (who was also the teacher of Longchen Rabjam) and Rikhor Repa. During retreat in his early twenties, Rangjung Dorje had a vision at sunrise in which first Vimalamitra and then Padmasambhava dissolved into the point between his eyebrows. In that moment he realised all the teachings and transmissions of Dzogchen, the Great Perfection. Through having mastered both of the profound paths of Mahamudra and Dzogchen, in him they became as one. Thus uniting the highest views and practices of the Kagyu and Nyingma lineages, Rangjung Dorje then founded the Karma Nyingthig. He went on to compose many volumes of teachings on Mahamudra and Dzogchen. At the age of thirty-five, Rangjung Dorje experienced visions in which he received, understood and realised the complete Kalachakra Tantra. He composed the famous treatise on Anuttaratantra, the Profound Inner Meaning (Zabmo Nangdon), which became one of the central texts of the Kagyu Vajrayana tradition. Realising the meaning of the Kalachakra Tantra, he understood the movements of the sun, moon and planets and their relationship to the body and mind. On this basis he composed clear astrological texts and devised a system of astrology. This Tsurphu Tradition of Astrology is still in use today. This understanding also contributed to his profound mastery of medicine. In 1331 Rangjung Dorje received an order to attend the Mongol Yuan court of Togh Temur (Emperor Yuan Wenzong) in the Imperial capital of Daidu, modern-day Beijing. However, both the Emperor and his successor died, leaving the task of mediating the succession to the Karmapa. In 1333 he officiated at the enthronement of Toghan Temur and gave transmissions and teachings to the new Emperor. The Karmapa returned to Samye especially to find a long life elixir for the Emperor, through which Toghan Temur became the longest-lived of all the Mongol Emperors of China. He left in 1334, having received permission to leave China only after having promised to return in two years. Therefore, in 1336, not long after he had arrived back in Tibet he had to return to Daidu. Once there, he conferred the Kalachakra empowerment on Toghan Temur and received the title of Goshir, State Preceptor. During his travels Rangjung Dorje had established many monasteries in Tibet and China. In 1338, while still in Daidu, the Third Karmapa declared, “I, a yogi, am like a cloud. May all those who wish to grasp the meaning of my teachings do so quickly!” He passed into Parinirvana only a year later in Daidu, at the age of fifty-five or fifty-six. As a final display of compassion, the following night his image appeared within the full moon, and was seen by the people of China, Tibet and Mongolia. Shortly before passing away, Rangjung Dorje left oral instructions with his general secretary, Rinchenpal, indicating the time and circumstances of his next incarnation. Rinchenpal found his reincarnation just as the Karmapa had instructed. Rangjung Dorje composed widely on a diverse range of topics. Of particular importance to the Kagyu lineage are the above mentioned Profound Inner Meaning, and The Treatise Distinguishing Consciousness from Wisdom, The Teaching on the Tathagatagarbha – the Buddha Essence and The Mahamudra Aspiration Prayer. Among his many prominent disciples were the First Shamarpa (Drakpa Senge), Longchen Rabjam, Dolpopa, Yakde Panchen and in particular, the disciple who was to become the next lineage-holder, Gyalwa Yungtönpa.